A little while ago, I came to a realization about myself: I wasn't "into" my style. What was fashion, anyway? I surely didn't have an answer. After mulling it over for far too long, I began a quest. I got online and started doing some research and came across this personal shopping service called Stitch Fix. After reading a number of reviews, I decided to purchase a subscription — and before I knew it, articles of clothing hand-selected for me were being sent to my doorstep once a month. What did you gather from this story I just shared with you? A majority of people would probably say: I had a problem, I looked into possible solutions and I finally came to a decision on how to resolve the problem. If that was your answer, I'm not surprised. When most people talk about storytelling, they usually reference the literal content of the story — the "here's what happened." The problem with this is that such a description only draws from what is explicitly stated. While every story needs a plot, it is important to know that the plot isn't the entire narrative. Let me explain. Storytelling is a valuable asset for many reasons, but it often gets overlooked as being a valuable asset for growing your business. What many don't realize, is that storytelling goes far beyond the how and why. Truly delivering the value of the narrative elements requires you to zoom out and look at things from a broader perspective. When marketers think of their prospects, they typically think of them in terms of the buyer's journey. The journey is equivalent to the plot of the story. But the real journey is not just a plot. The prospect's relationship with your company is part of the journey. The websites on which they spend their time are parts of the journey. They, themselves, are part of the journey. The first element you must take into consideration when creating a compelling narrative is your main character. In the eyes of marketing and sales executives, the character of your story will be your prospect. Every other character in the story is just there to help the prospect reach their end destination (and that includes you!). The character is your hero, and everything in the story should weave back to them. Remember my style progression? I was the hero of that tale. The Stitch Fix team became the characters guiding me toward a resolve to my conflict. Every member of your marketing and sales teams should work toward helping your heros achieve the same resolve. As we previously mentioned, you can't have a story without a plot. The plot is the equivalent of the buyer's journey. We start in the awareness stage, when we become aware we have a problem. In my story, the awareness stage began at the realization that I wasn't reaching my so-called style potential. Next comes the consideration stage, when we look into possible solutions. Last comes the decision stage, when we decide on a solution. These three stages of the buyer's journey encompass the plot of the narrative. Mapping this plot is key to incorporating the narrative elements into your marketing and sales strategy. The moment I recognized my dislike for my style, the conflict for my story emerged. The conflict initiates a story, and should be where you focus when developing your marketing messaging. The thing about conflicts, though, is that you are not limited to just one. New threats or fears can emerge as your character gets closer to solving the initial conflict. My original conflict may have started as indecision regarding my personal style, but as I moved through my buyer's journey, new conflicts arose. I had to pay what, again? How long did I have to wait to solve this? 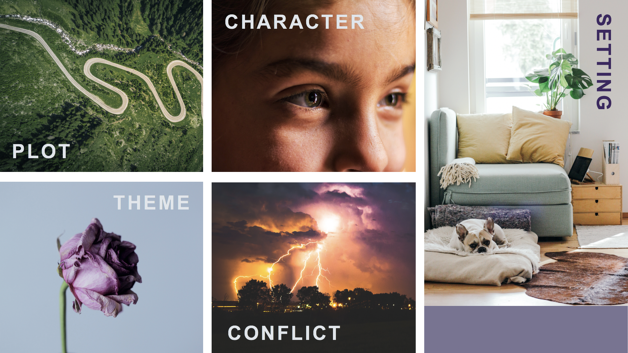 These new conflicts — but more importantly, the deeper value of the conflict, lead us to our next narrative element: the theme. Theme is the subject of much debate. For the purposes of this blog post, let's define theme as an underlying reality within a story. In my case, the conflict was my style choice, but the theme was something completely different: acceptance. What I really wanted wasn't to have the best style in the office, but to feel accepted, both by myself and by those around me. The theme is the central idea to any good story, and is the underlying reality of the hero's problem. Of all the narrative elements, theme is probably the least obvious at the outset of a narrative, and is usually revealed by the actions of your character as they move through a plot. However, if you are a marketer creating content, you should really have a reason for creating that content. That reason can be your theme. In the case of Stitch Fix, their content had to convince me I could be accepted through choosing to be my genuine self. The reason for creating content, then, wasn't "to sell a product" or "to help her fix her style." Their reason for creating content was to communicate this concept of celebrating self to me, and allow me to reach the level of acceptance I craved. They say in marketing and sales, content is king. But what about context? Context is another key element to developing a successful story and content marketing strategy. In the story I shared with you, I purchased a subscription after performing online research. The subscription, through a personal shopping service, comes to my home, where I have another experience with the brand. The context of a story can help you create channel plans that provide your prospects with the most seamless guidance possible. It is trend based.The time period (technological trends) and subject matter can both influence actions your prospects take. You couldn't possibly expect someone interested in purchasing a single dress to reach that decision by reading a book about that dress. But you could expect that person to be interested in viewing a rotating image on your website. It is plot-involved. The setting both changes with the plot and influences the plot's progression. Where do you want your prospect or customer to go next? What about after that? What happens when they get there? It is channel-focused. To use setting effectively, you must know your best-performing channels. Why Do the Narrative Elements Really Matter? It may seem simplified, but the fact that narratives are fun is one of the greatest reasons they are so effective. Stories unfold in front of us all the time. For instance, a couple of months ago, I stood on a friend's porch in the woods of Vermont and peered through the leaves around us only to spot a teenage couple, all dressed up, getting their picture taken by their parents. I immediately came to the conclusion that they were a couple going to prom, and those were their parents capturing their big night. I couldn't help but smile. We use narrative to make sense of the world around us. We piece together information to make it meaningful. Understanding information in a cohesive framework like this can make us feel good. Personal narrative can easily elicit empathy. And, finally, we must be able to successfully assign the correct significance to things if we want to operate safely. You might say that spinning narratives literally keeps us alive. Creation Myth: Every great brand offers its own story of coming into existence. Testimonials: Customer success stories create aspiration and motivation. Product Value: Product value may be rooted in narrative. In fact, in their project, Significant Objects, Rob Walker and Joshua Glenn showed that subjective value can be objectively measured. In short, customer acquisition is driven by value and value is driven by perception. The story behind your product — and how that story relates to your prospect — is what will drive your prospects to buy it. If you can convey value to your prospects through an operationally-pervasive narrative that's specifically designed around their needs, you will have won out against your competitors. So, how do you go about incorporating the five narrative elements (plot, setting, character, theme and conflict) into the way your marketing and sales teams operate? For sales to act as a guide to the hero's final destination, they must know where they have already been and where they should go next. Marketing automation platforms are a great tool for flowing information about qualified prospects from the marketing team into the hands of the sales team. Marketing should be focusing on providing sales with content that corresponds to the conflict the prospect has expressed. Even if the content is about your product, it is critical to ensure that the message you provide relates back to hero and their relationship with that product. The marketing-to-sales handoff is a crucial point in the marketing funnel. As a marketer, one way you can set your sales team up for success is by creating trainings around the handoff process. Ask sales to continue guiding the prospect through their story. That might mean your sales team members should share stories with similar plots to those of their hero, in order to inspire the next action, or it might mean they offer references. Either way, sales and marketing should be fully aligned with regard to messaging, the character's desires and tendencies, and the state of the plot today. Marketing can help sales get there via trainings. It is not uncommon for objections to arise as a character progresses through their story. One of the best ways to handle this is to be proactive. Marketers can prepare sales for these objections by providing as much lead intelligence as possible and by offering valuable content that will help minimize the conflict. 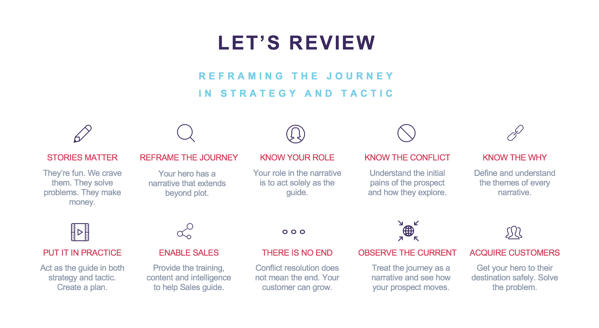 The main thing to remember when creating a narrative is that weaving the narrative elements into the operational efforts of your revenue team is far bigger than plotting the buyer's journey alone. The buyer's journey may be the plot, but it's just one component of a cohesive narrative. For those of us in marketing and sales, it is vital that we fully comprehend who our hero is, the conflict they experience, the deeper meaning of their conflict, the setting they prefer to interact with, and the plot of their movement from prospect to customer — and on to delighted advocate. But most of all, we need to remember that storytelling goes so much deeper than a single blog post. It goes beyond shaping a fun, easy read that motivates someone to click a link. 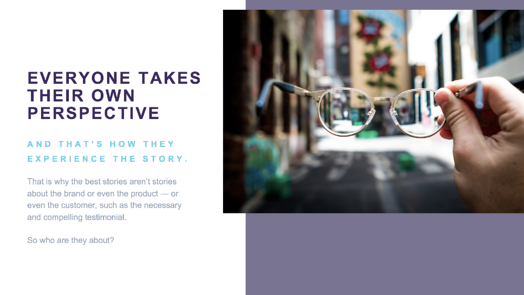 Indeed, storytelling is an integral component of your operational strategy, and effectively executing on that strategy means incorporating the narrative elements into your marketing and sales process. Do it successfully, and you'll powerfully motivate your prospects — and ensure the future growth of your business. Download our guide to learn how your company can create a content strategy that reaches your audience, drive conversions and enables future growth.